All setup and technical information about SPIDriver can be found in the User Guide. For Windows, download the latest installer here. For Mac, download the GUI here. For Linux, download the GUI here. All design files and firmware are in the SPIDriver open source repository. SPIDriver is an easy-to-use tool for controlling SPI devices. It works with Windows, Mac, and Linux, and has a built-in colour screen that shows a live logic-analyzer display of all SPI traffic. It uses a standard FTDI USB serial chip to talk to the PC, so no special drivers need to be installed. The board includes 3.3 and 5 V supplies with voltage and current monitoring. If you use SPI devices - LCD panels, flash memory, sensors, LEDs - you'll know that the most frequently asked question is "what's it doing now?" SPIDriver shows you what's happening on the SPI bus in real time, so no more guessing about the bus state. It's designed to make talking to SPI hardware a smooth, intuitive process. That's good whether you're a hardware debug wizard or are introducing a class to SPI for the first time. The current and voltage monitoring let you catch electrical problems early. The included color coded wires make hookup a cinch; no pinout diagram required. It includes 3.3 and 5 V supplies for your device, plus a high-side current meter. If you use SPI hardware, you need SPIDriver. 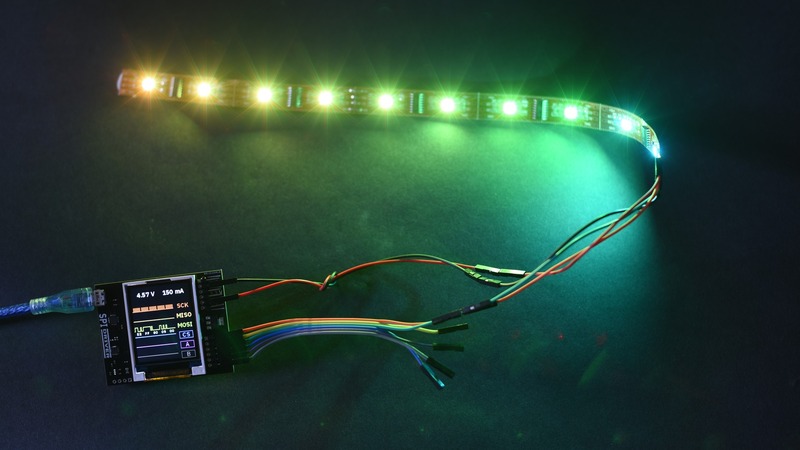 You can directly control LEDs and LCD displays without having to go near a microcontroller. If you need to examine, backup, or clone an SPI flash, SPIDriver is the ideal tool. It can read, backup, and restore standard SPI flash chips in-circuit. If you work with SPI sensors, you can debug, test and calibrate them from your desktop using the programming tools you use every day. Want to get a picture on a graphic display? Graphic displays can be a pain, so it can feel like a real achievement getting them to display an image. 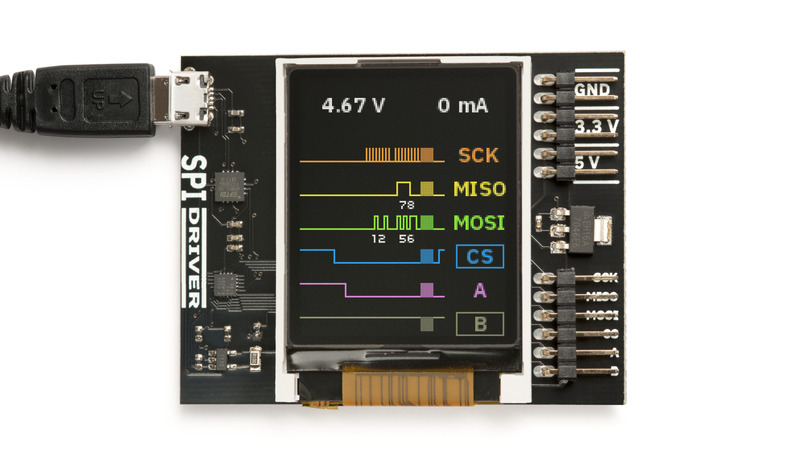 SPIDriver is a natural fit for driving, testing, and evaluating different displays. 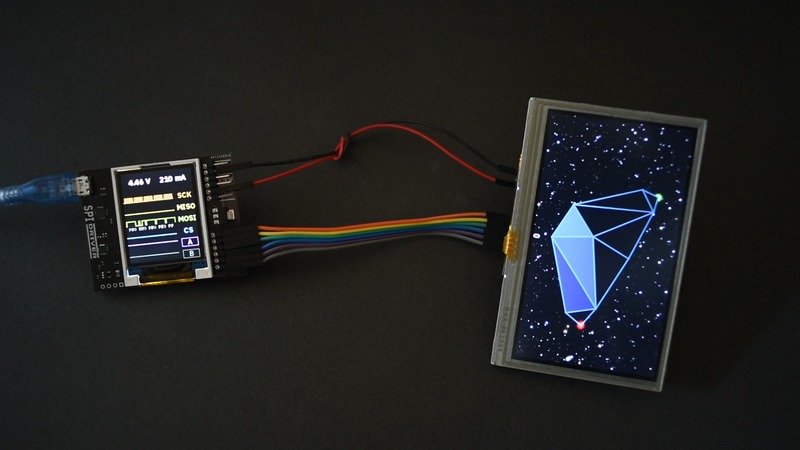 Of course, SPIDriver also works perfectly with the Gameduino series of graphic touch screens. Want to program SPI flash? SPI flash is very common, and by using a test clip, SPIDriver makes it convenient to read and write SPI flash in-circuit. Just attach the clip and you can backup and restore flash contents directly. 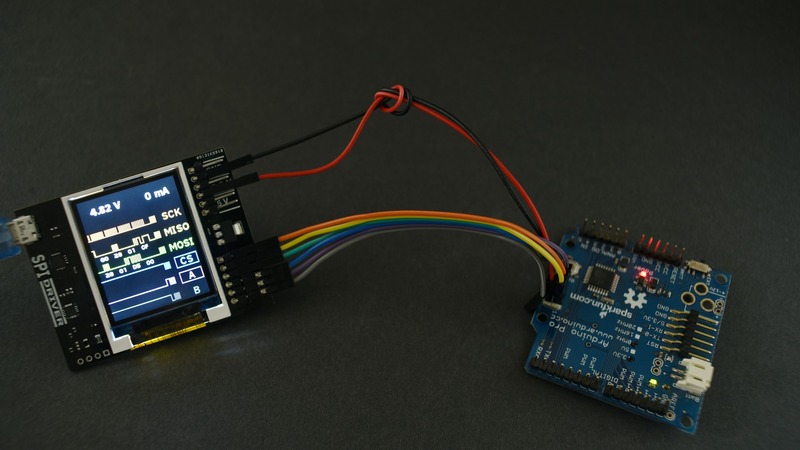 Atmel microcontrollers - like the Arduino - in-circuit programming use standard SPI pins, so a short script is all it takes to read or write an Atmel’s flash. SPI LED strips are also simple to hook up to SPIDriver, and being able to control them directly makes them much more fun! It’s fast enough to smoothly animate long strips and achieve POV effects. Short strips can be powered directly by the SPIDriver's beefy 470 mA built-in supply.